This is RuggedRio Outfitters - a YazyCraft brand - This camping / survival kit is a necessity for people who like to go on long hikes or camping trips, where you will need to start fires, keep warm and cook. It's a great gift for anyone who loves the outdoors and survival, but also wants to take their phone along with them. 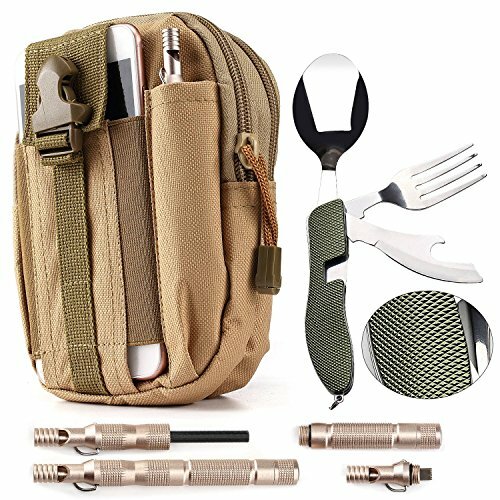 FOLDING UTENSILS: This is a four in one multitool, with a knife, fork, spoon and bottle opener. It's lightweight and sturdy, made from stainless steel, and designed to fit in your pocket. MAGNESIUM & FLINT FIRE STARTER: This small pencil sized stick contains magnesium and flint, which when scraped together create sparks, in turn creating fire. It's great to have on you whcn camping or hiking. CUSTOMER SERVICE: We respond to most customer service messages within 8 hours, and all within 24 hours. FAST SHIPPING: We always ship within 24 hours of you order, and if you have Amazon Prime, you can get FREE 2-day shipping on eligible orders! If you have any questions about this product by YazyCraft, contact us by completing and submitting the form below. If you are looking for a specif part number, please include it with your message.